Tracey Loughran delivers a fitting tribute to the men who suffered in the First World War, and in more modern conflicts. Editor's note: This article is from the forthcoming March edition, published early today to mark 100 years since the publication of Charles Myers' seminal Lancet paper. View our archive for much more on Charles Myers and shell shock. In 1914 Britain was the only major European power without a system of conscription in place. Over the next two years, the second-largest volunteer army in the history of the nation was raised (Gregory, 2008). Although the First World War is often remembered as a war of conscripts, 2.5 million men from the UK enlisted in the armed forces without any form of legal compulsion. One hundred years after the outbreak of the First World War, it is difficult to understand what motivated men to fight, and how they possibly withstood the horrors of the trenches. These are complex and contested historical questions, but it is clear that deeply embedded ideas of honourable masculine behaviour guided the actions of many men. Oscar Wilde’s eldest son Cyril was perhaps more worried than most men about how others might judge his ability to live up to masculine ideals, but his explanation of his decision to join up is nonetheless telling. He believed that ‘first and foremost, I must be a man. There was to be no cry of decadent artist, of effeminate aesthete, of weak-kneed degenerate.’ He asked ‘nothing better to end in honourable battle for my King and Country’ (Sinfield, 1994, p.126). He died in May 1915 at Neuve Chappelle. The success of the voluntary recruitment campaign represented, at least in part, the triumph of Victorian ideals of manly behaviour. But when we think of this war, we also think about those who could not live up to the exacting demands of this ideal, no matter how hard they tried. Only a few months after war broke out, soldiers of several combatant nations began to manifest strange nervous and mental symptoms. Doctors in all countries immediately noted the similarity of these disorders to well-established diagnostic categories such as hysteria, neurasthenia, and traumatic neurosis. They also debated the unknown effects of high explosive artillery on the central nervous system. In all combatant nations, doctors formulated theories that explained soldiers’ symptoms as the result of concussion, or invisible molecular damage to the nervous system caused by exposure to repeated shell blasts. As the war went on, increasingly sophisticated psychological theories were formulated to explain symptoms as the outcome of a conflict between the instinct of self-preservation and the desire to fulfil one’s duty, or as the result of the attempt to repress memories of war experience. Nowadays, ‘shell-shock’ is most often perceived as a form of psychological breakdown, equated in the popular mind with the modern construct of post-traumatic stress disorder (PTSD). We do not know exactly how many men were diagnosed and treated for ‘shell-shock’ during the war or in its aftermath: the number most often quoted for the British Army is between 80,000 and 200,000 men (Leese, 2002). But even these estimates are based only on those formally diagnosed and treated for ‘shell-shock’. It is likely that many men suffered nightmares, distressing memories of war experience, and other traumatic symptoms, but coped well enough in everyday life to avoid seeing a doctor. These men endured the war, but we do not know how they picked up the threads of their lives. The only indisputable fact is that after 1918, ‘shell-shock’ formed part of a new popular understanding of the potential effects of war on men’s bodies and minds. Many historians have argued that the experience of mass breakdown in the First World War led to the reconfiguration of ideals of masculine behaviour. The literary historian Samuel Hynes believes that after 1918, war was imagined in fundamentally new ways. The soldier hero was no longer the main actor in popular conceptions of war; now, he was accompanied by the coward, the frightened boy, and the ‘shell-shock’ victim (Hynes, 1991). For Elaine Showalter, ‘shell-shock’ represented ‘a crisis of masculinity and a trial of the Victorian masculine ideal’; it was an unconscious protest ‘not only against the war but against the concept of “manliness” itself’ (Showalter, 1987, pp.171–2). Other historians have suggested that the acknowledgement that any man could break down under sufficient stress ‘forced western society to take note and modify its views on mental illness, human motivation, and other issues far beyond the immediate problems of disabled soldiers’ (Feudtner, 1993, p.409; see also Bogacz, 1989; Stone, 1985). From this perspective, ‘shell-shock’ revealed the ultimate fragility of the human psyche, and undermined the bombastic stoicism applied to so many areas of social life. However, I argue that although the experience of 1914–18 did force popular awareness of the potentially traumatic effects of war, it did not completely overturn existing conceptions of ideal masculinity. This is evident in the desire of First World War psychologists to restore soldiers to self-control and manly ‘character’. Doctors used many different forms of treatment for ‘shell-shock’ during the war, and most soldiers were probably treated using conservative therapies. In a few institutions, such as Maghull Military Hospital near Liverpool, and Craiglockhart War Hospital in Edinburgh, some influential doctors developed analytic techniques. It was rare for doctors to employ these kinds of ‘talking cures’, but these treatments show that even the most sophisticated psychological approaches developed to deal with shell-shock’ drew heavily on concepts of self-control, self-reliance, and strength of character. ‘Analytic’ doctors favoured forms of treatment based on analysis and re-education. They believed the prolonged strain of war service exhausted the patient and lowered his self-control, which led him to fixate on an emotional element of his war experience. The role of the doctor was to help the patient understand the ‘true significance’ of his history and condition, and this was achieved through the therapeutic process of re-education (‘the process whereby causal factors, which have been elicited by analysis, are modified or re-arranged, so that they no longer produce morbid effects’: Hart, 1927, p.125). The doctor conducted extended interviews with the patient to ascertain the exact nature of the incident(s) that had led to breakdown. The doctor then helped the patient to understand why the symptoms had occurred, and to guard against their recurrence by imparting understanding of the psychological processes behind them. As the patient gained insight into the nature and origin of his symptoms, both the symptoms and the emotional tone connected with them would disappear. These doctors displayed considerable empathy for their patients. But they did not waver from the belief that the war must be fought to the finish, and that ‘shell-shocked’ men must, if possible, be returned to some form of service (not necessarily as combatants). Consequently, ‘analytic’ doctors did not reappraise the fundamental tenets of Victorian and Edwardian ideals of masculine character. Instead, they reinforced the importance of living up to the values embodied in this ideal. The psychoanalyst David Eder described a case in which hypnotism failed, and he reverted to persuasion: Eder’s exhortations prompted ‘a flood of tears’ in the patient, who ‘lay awake all that night making up his mind that he would walk, and the next day the sticks were relinquished, he was cured of the paraplegia’ (Eder, 1917, pp.72–3). It is difficult to conceive of a more literal demonstration of the belief that patients must learn to stand on their own two feet. ‘Analytic’ doctors consistently described re-education in the language of a militarised, masculine ethos of honour, stoicism, and self-control. The patient’s effort to gain a ‘proper’ understanding of his war experience was depicted as a confrontation, in which he squared up to his past and mastered it. The doctor had to make the patient see the impossibility of ‘running away’ from troubling memories (Rivers, 1918). Doctors did not see this form of treatment as the imposition of masculine values on subjects who had rejected these standards. They believed they were helping ‘shell-shocked’ men to regain the character and self-control that would allow them to live with themselves after the war. Even the most sophisticated treatments for ‘shell-shock’ depended on the reassertion of masculine values. Has so much really changed today? Rightly or wrongly, the First World War is popularly conceived as one of the major tragedies of the 20th century. It is very tempting to look back and think ‘we’ now know better, and that the legacy of ‘shell-shock’ is an improved understanding of war trauma. Perhaps this is true in some respects. Certainly, although no one has worked out a definitive way either to prevent men breaking down or to cure PTSD, and there are still serious gaps in the provision of psychiatric services for veterans, it is no longer possible for governments, militaries and public to ignore the existence of traumatic responses to combat. Yet when we talk about ‘shell-shock’, we often unwittingly reinforce older ideals of heroism. This is shown by newspaper coverage of the decision, in August 2006, to issue a blanket pardon of the 306 British soldiers executed for desertion, cowardice or other offences (excluding murder) during the First World War. For the most part, this decision was celebrated in the media. Journalists explained that it was now known that many of those executed had been suffering from ‘shell-shock’. In these reports, the psychological injuries suffered justified the pardon. However, coverage also implicitly bolstered traditional ideas of heroism and cowardice. This is nowhere more evident than in newspaper accounts of the life and death of Private Harry Farr, the test case for the decision to pardon the soldiers. Farr, a scaffolder from London, joined up on the outbreak of war, but developed ‘nervous trouble’ and reported sick with nerves four times between 1915 and 1916. This included five months in hospital, during which time he had an uncontrollable shake so bad he could not hold a pen. In September 1916 he refused to go back to the trenches, stating that he could no longer stand the explosions of artillery. He was reported as trembling and not in a fit state, but was still executed in October 1916 after a peremptory court-martial. 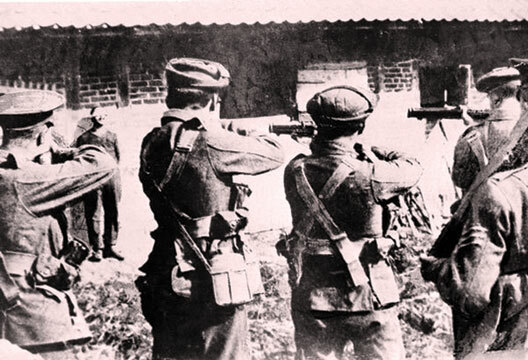 Newspaper coverage emphasised that Farr was undoubtedly suffering from ‘shell-shock’, and that this doubtless applied to many other executed soldiers. The use of Farr’s story in the media is more ambiguous than it first appears. Farr was presented as both victim and hero. As a volunteer, he had proved his courage; he broke down not once, but several times; and he was executed because he refused to return to the front, not for actions that put his comrades immediately in danger. Because Farr suffered so much, his case does not involve confronting our own attitudes towards heroism, cowardice and the demands of war. If Farr is the exemplar of the ‘shell-shocked’ soldier, then ‘we’ can remain convinced modern sensibilities are more alive to such suffering. The truly radical reappraisal of social and cultural expectations of military masculinity will come when it is accepted not just that ‘shell-shocked’ men could be heroes as well as victims, but that heroism does not need to be part of our discussions of ‘shell-shock’ – when we stop holding the dead up to these standards at all. Narratives of progress are consoling, but perhaps our starting point should be not what has changed, but what remains to be done. This is the most fitting tribute to all the men – heroes, victims, cowards, malingerers – who have tried since 1914 to survive war, in whatever ways they could. Bogacz, T. (1989). War neurosis and cultural change in England, 1914–22. Journal of Contemporary History 24, 227–256. Eder, M.D. (1917). War-shock: The psycho-neuroses in war psychology and treatment. London: William Heinemann. Feudtner, C. (1993). ‘Minds the dead have ravished’: Shell shock, history, and the ecology of disease systems. History of Science 31, 377–420. Gregory, A. (2008). The last Great War. Cambridge and New York: Cambridge University Press. Hart, B. (1927). Psychopathology: Its development and its place in medicine. London: Cambridge University Press. Hynes, S. (1991). A war imagined: The First World War and English culture. New York: Atheneum. Leese, P. (2001). Why are they not cured? British shellshock treatment during the Great War. In M. Micale & P. Lerner (Eds.) Traumatic pasts: History, psychiatry and trauma in the modern age, 1870–1930 (pp.205–221). Cambridge: Cambridge University Press. Leese, P. (2002). Shell shock. Basingstoke: Palgrave. Rivers, W.H.R. (1918, 2 February). An address on the repression of war experience. Lancet, 173–177. Showalter, E. (1987). The female malady: Women, madness and English culture, 1830­–1980. London: Virago. Sinfield, A. (1994). The Wilde century: Effeminacy, Oscar Wilde and the Queer Movement. London: Cassell. Stone, M. (1985). Shellshock and the psychologists. In W.F. Bynum, R. Porter & M. Shepherd (Eds). The anatomy of madness. Volume 1: People and ideas (pp.242–271). London and New York, Tavistock.